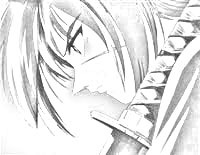 Kenshin is a wanderer who now carrries a reverse-blade sword so that he can protect people to repent for killing so many during the revolution of japan. He was nown as battousai the manslayer because he was supposedly undefeatable. He has red hair and blue eyes and always replies by saying pronouns followed by verbs pertining to the sentence, like that they were, or that he does. He also likes to say "Oro!?" wih means "Huh!?" Kaoru is the instructor of the kamiya kasshin dojo in tokyo. She is always positive and trying her best. 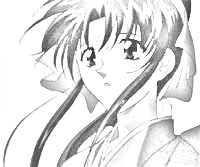 She has feelings for kenshin but she is afraid to express them. She is called raccoon girl because she looks at like a raccoon. She is happy most of the time and is always smiling. 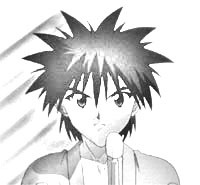 Yahiko thinks he is a great swordsman, but he's only a beginner. He has the biggest ego that is always getting him in trouble. He comes from a long line of samurai and has a powerful swordsman spirit. 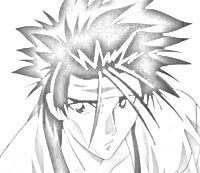 Sanosuke is lazy and he always acts cool. He enjoys beating up people and getting into fights. He freeloads off of kaoru and basically sticks around the dojo because he wants to see how different kenshin is from the other imperialists. Keshin and the others saved her from Takeda Kannryu so she decided to study medicine with Dr. Gensai. She fixes and heals the group when they get hurt. She is originally from Aizu and her family's house caught on fire, but only she escaped. She waits for the day she will see them again.